This is an opportunity to honor and celebrate the women in your life or yourself with a unique, memorable and everlasting gift. Let’s celebrate mothers, grand-mothers, fur baby mothers, sisters, daughters, nieces and best friends in your life. For this special week, I am offering a 20% Discount on my Spiritual Psychic Readings for 15 minutes, 30 minutes and for Pet Communication. Reminder this can also be given as a Gift Certificate. Purchase now and schedule your appointment at a convenient time that works for you. This Discount Ends at 10:00 PM May 13, 2018. Grab Your Reading Now! Take some time and listen to the wonderful program we had last night. It was a wonderful group of people that came together and so many shared their personal problems and I offered solutions. I’m sure you’ll enjoy this program. Click on the cat picture to listen. To assist you in taking advantage of this powerful time of the year I am discounting my Phone Spiritual Readings. The new moon occurs on March 9, 2016 at 1:53 UTC marking the beginning of a new cycle. The new moon is a time of initiation and new beginnings. It is the time to plant a seed of what you want to grow in your life. Making a wish, an intention, a promise, or a vow is a common custom. It is believed that as the moon grows, that your intention or goal will too usually by the time the moon completes its cycle and returns full circle to new again. Throughout time farmers knew the importance of the New Moon, so they started to plan their harvests and seeding around the moon cycles. These farmers noticed through time passing that the seeds that took the best were seeded during the new moon. The new moon is also a time of seeding ideas and intentions. Theses seeded ideas will then sprout with the coming full moon just as the seed lie waiting in darkness to break forth into the light to bring fruit, so should you allow the gestation and creation of such idea to bring about physical results. Regardless of prior mistakes, missteps or faltering, This New Moon offers encouragement and support. For those with creative plans and the ability to be spiritually aware, financial prosperity and abundance are well within reach. What Is In Store For You This Moon Cycle? Find out with my special New Moon Reading. Your Present – There’s no time like the present. Where are you currently on your path? Your Future – Where is your path leading you? This is a great to see if you want to adjust your path or continue as you are. What Your Guides Want You To Know – Special advice from your guides. What do they want you to know right now? 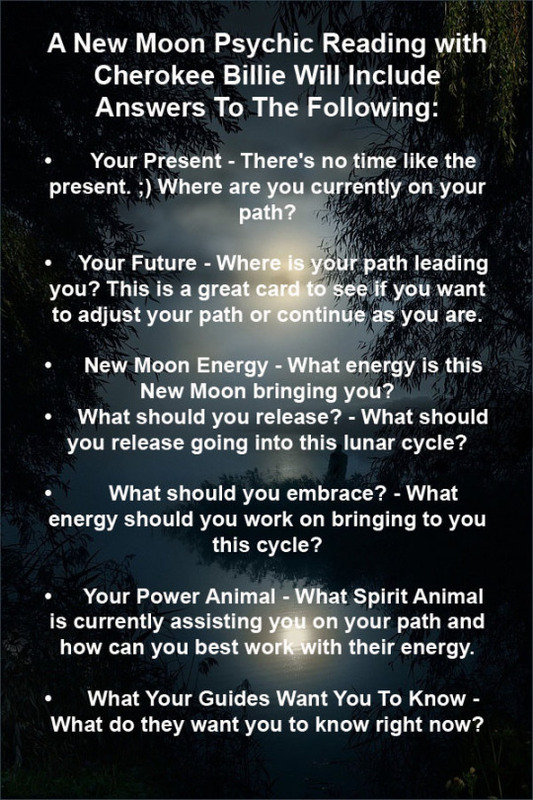 Your Power Animal – What Spirit Animal is currently assisting you on your path and how can you best work with their energy. This New Moon is at 23 degrees Cancer, 9:24 PM. Each New Moon gives us an opportunity to let go of what we do not need, give thanks for what we have, and start our lives new once more. New Moon Manifestation Ceremonies That You Can Perform. Look after yourself, and you’ll be ready to throw yourself into this New Moon with gusto! It’s a wonderful, transformational vibe. If you feel like something exciting is about to get started, you’re right! We’re about to turn a big corner. It’s going to be glorious. Make sure you dance! A new moon is a wonderful time to receive a spiritual reading. This is a time of transition and my spiritual services can help you move forward and receive the most from life. Here is what you will receive from a New Moon Reading with me.